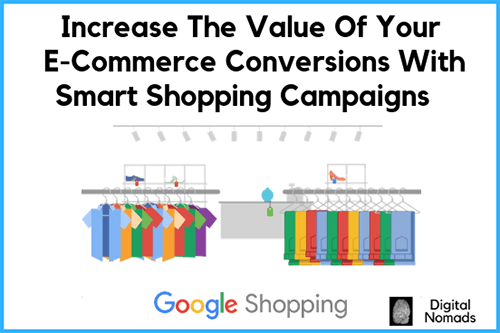 We have already discussed the opportunities Google Shopping campaigns give to e-commerces in our previous blog post. With this article we’ll try to analyze more closely what Smart Shopping campaigns are and why you should always choose to upgrade to this kind of campaigns when you run shopping ads. Differently from classic shopping campaigns which target users with their ads only in the search network, smart shopping campaigns target users in the Google Display Network, YouTube and GMail as well. The Google Display Network (also known as GDN) is composed by all the websites which show Google Ads among their content. The option of targeting the GDN dramatically expands the reach of your ad. The specific products which previously appeared to a certain user in the search network (under the form of shopping ads) or which were browsed in your website are shown under the form of display ads in the GDN. These hyper targeted ads technology is also known as “dynamic remarketing”. Please see below an example of dynamic remarketing ads for iPhone cases in the display network. Dynamic remarketing dramatically increases your conversion rate and guarantee a high level of precision when it comes to targeting option. You will be able to set-up a smart shopping campaign only if you have the conversion tracking installed in your website with transaction specific values. In addition to that you must have a remarketing global site tag on your website and you must have tagged your site for dynamic remarketing. You also need to have at least 20 conversions registered for the last 45 days across existing Shopping campaigns before you can run a smart campaign. Last but not least you need to have a remarketing list of at least 100 active users, this list will be used to run the dynamic remarketing ads. By default smart shopping campaigns maximise your conversions value for a given budget (“Maximize Value”). This is the new automated bidding option introduced by Smart Shopping campaigns. The aim of this bidding strategy is to bring in as much revenue as possible out of a given budget. The other available automated bidding option for smart shopping campaigns is the target return on ad spend (“Target ROAS”). This strategy is based on setting a specific revenue goal for every dollar of ad spend. If the target goal for your campaign is $2 worth of sales revenue for each $1 you spend on ads, you can set a target ROAS of 200%. When you set a target ROAS as bidding option, your bids will be optimized to reach your target within your daily budget. If you set your ROAS too high your budget may not be spent throughout the day and your sales may decrease. Be realistic when it comes to set your target ROAS. To find the optimal performance you can test the two options. Our suggestion is to allow the campaign to run with a specific bidding strategy for at least for 15 days so that the machine learning will have enough traffic data at its disposal to optimize. Allowing this time to pass will also account for the conversions delay. Having the possibility to re-target in the GDN people who saw your shopping ads in the search network is definitely a great opportunity to boost not only your conversion rate but also your conversions’ value. It’s crucial to be visible with highly relevant ads in this channel as according to Google, the Display Network reaches over 90% of global internet users expanding across 2 million sites. Having your remarketing ads visible in the GDN completes the circle of engagement with your potential buyers. If you still have doubts on how to get the best results for your smart shopping campaigns get in touch with us!